We spent the afternoon helping volunteers from the Friends of Atherton Parks group with some of the fantastic work they do in our local park. Year 3 visited Eccles College to learn about animals and how they live. They had the opportunity to visit the 'zoo' and see a range of different animals in their habitats and learn about what they do to survive. Many thanks to Rev Reg, Jonathan and Church volunteers who made our visit to the Parish Church a truly reflective experience. Year 3 listened intently to the Easter Story as they toured the displays. 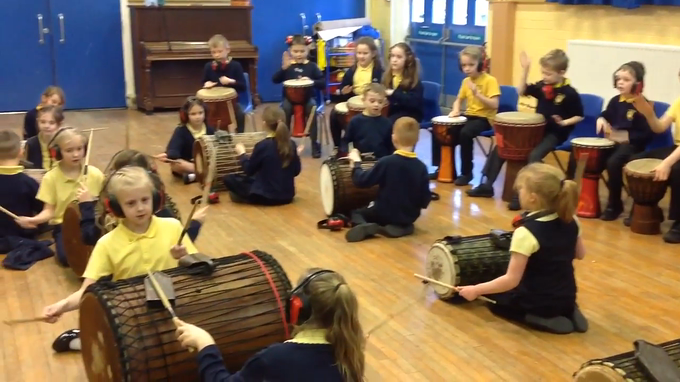 African drumming in Music Week proved a hit with the class! 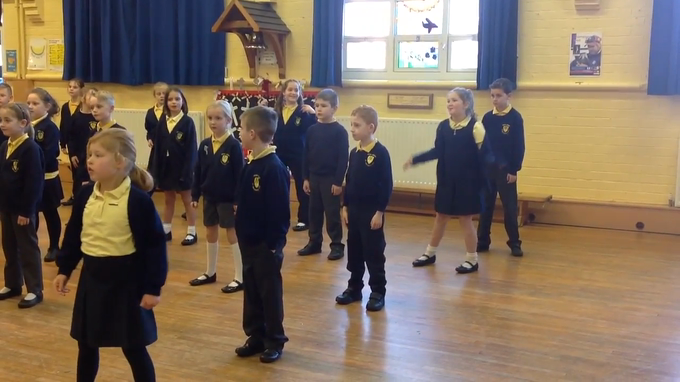 Year 3 and Year 4 are busy with morning rehearsals preparing for the I Sing Pop concert and CD recording. Make sure you join us in St Michael's Church for the live performance next Thursday 16th! The Year 3 Maori warriors invite you to take up their challenge during Continent Week! Next week will be Continent Week in geography. Year 3 will be learning about Australasia with a special focus on New Zealand. Year 3 showed Christmas spirit by wearing Christmas socks in the two weeks before Christmas. Year 3 were welcomed at Belong Village for our annual Carol singing. Joining in with familiar carols, Residents enjoyed singing along during their coffee morning. Well done children for such an entertaining performance and Merry Christmas to all at Belong! The class paid their respects at Atherton Cenotaph, attending the 11am service and researching their family service history. Well done to Y3 who raised around £85 for school funds at today's Summer Fair (9th July) on their homemade baking stall. Thank you to Mrs Mawson and Mrs Hunt for exquisite cupcakes. The children have all been busy baking with Mrs Kirkpatrick, bringing in their own recipes. Many thanks to the children who were able to come along and help on the stall, it is really appreciated and we couldn't have done it without you! The class have enjoyed two visits to the High School within the week. Making pop up storybooks was the theme on Wednesday 29th June when the children also had the opportunity to use specialist design & technology equipment. Last Friday 24th June the fine weather meant the Rounders session could take place on the all weather pitch. The children were able to build on the skills they have learnt in PE this term before team games. For a selection of more action photos, pop over to the PE curriculum page which is part of the Sport Menu. 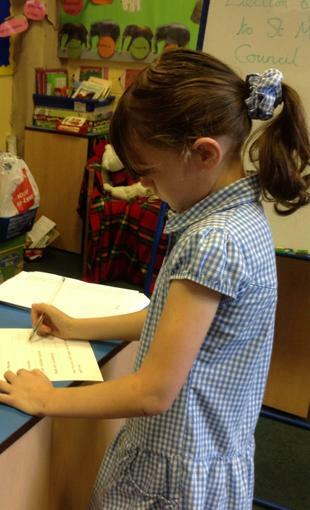 The class are now very knowledgeable about the life of Queen Elizabeth 2nd and have written excellent biographies. They have also talked about what rules they would like to have if they were a monarch and have delivered their versions of Her Majesty's Christmas Day speech! The class tortoise is now waking and will soon join us back in school where Y3 will give him a health check. Well done Flash for getting through the winter! Weather permitting, the class now have the opportunity for lunchtime Rounders Club with Mrs Evans. The sessions are 30 mins after lunch and children need to have PE kit in school to take part. The sessions rotate between KS2 classes. As Y3 compete for the Intra House trophy, it provides extra coaching for interested children. During the night on Thursday 10th December, there must have been an intruder in Y3 classroom. On Friday morning, the children spotted small footsteps leading to the Christmas tree. When they examined their Christmas stockings, each had a chocolate reindeer inside! Tied onto the top of the Christmas tree was a small red neckerchief. The teachers are baffled and Mr Gregory said that when he left school on Thursday, he didn't see anything unusual. However, Mrs Evans noticed an elf was in school - could she have been the mystery visitor? Well done Year 3 on presenting an outstanding class assembly. Here is a highlight for all to enjoy. (Click on the arrow). Get those summer barbecue plans ready! Year 3 have learnt how to make a corner wall at Westleigh High and are raring to go. We observed the two minutes silence at Atherton Cenotaph on Remembrance Day with Rev Reg. Spending time there helped us to learn about the sacrifices our community has made for our freedom. Thank you all our families who shared service history and memories with us during Remembrance Week. A warm welcome to family, friends and visitors from the children and class pet! If we belong to Owl House, we are pictured wearing our own clothes - our reward for winning the house points last term. Our home project, to design and make a winter tortoise house, has been a huge success with the tortoise enjoying evening snoozes in stylish accommodation. Enjoy browsing through some of the photos. The autumn term cross country lessons were a huge hit with the class who really looked forward to muddy Monday PE. During the final week of half term, we held our class championship with a race for the boys, girls and then two mixed races. Congratulations to Isobel Ingram, 1st girl home and Ethan Ariss Hayes, 1st boy home. Both were presented with medals. Well done everyone for improving stamina and speed over the half term. Below you'll find information from last year's Y3. This term's home/school project has produced outstanding Time Capsules that would certainly inform future generations about children's lifestyle in 2015! The children have led table discussions about what's inside them and Mrs. Quinlivan has been fascinated by the imaginative presentation. 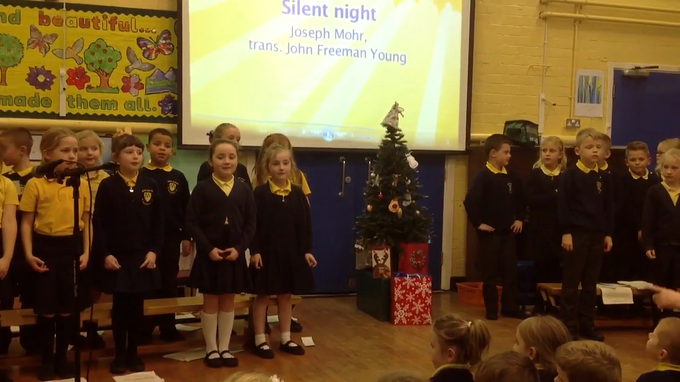 Well done children and thank you to parents for making sure the idea was such a success. Check out the photos of Y3 from Friday's (19/06) Book Day! Thank you parents for all your effort. It helped to make for a memorable day. Year 3 will be having their traditional strawberries and ice cream tea next Tuesday afternoon, 7th July. Esio Trot will be joining us to celebrate and reflect on our year together. Our favourite fictional pet at the moment is Tuffy, The Killer Cat! We've had a great time in role as Tuffy, writing his diary. He always gets into mischief and lives up to his name. His adventures include causing havoc around the house, upsetting the neighbours and hanging out with 'The Gang' of cats. He's rather like a feline Horrid Henry but we love him! 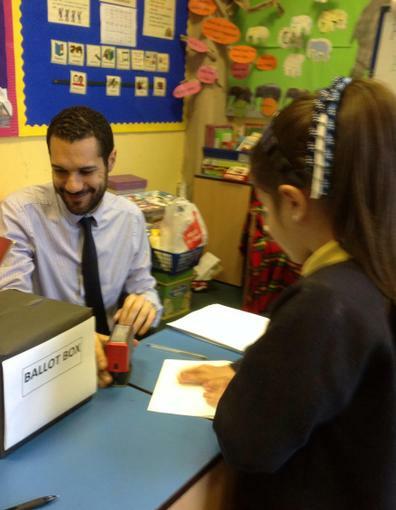 Year 3 have been putting into practice their learning about General and Local Elections in Britain. 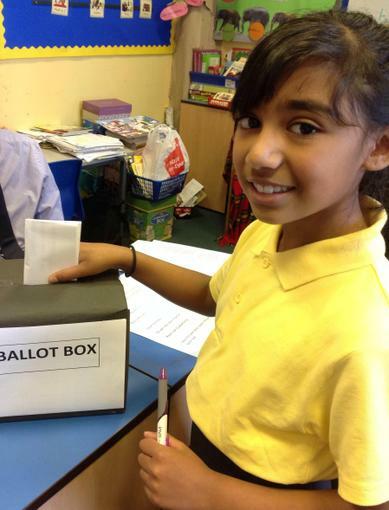 They have been choosing who will represent them on the School Council next year. 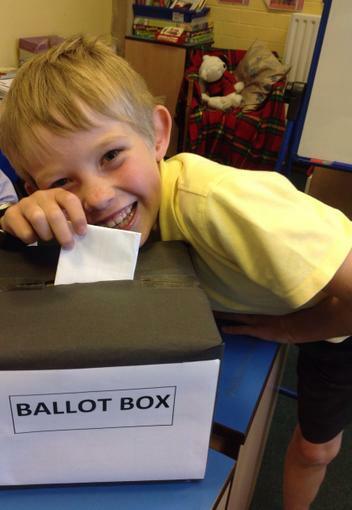 Manifestos have been created and shared ; candidates have faced the electorate in Y3 Question Time ; secret balloting on the hustings has taken place and there's been an official count. Results can't be announced yet as we are waiting for a postal vote (poorly child). 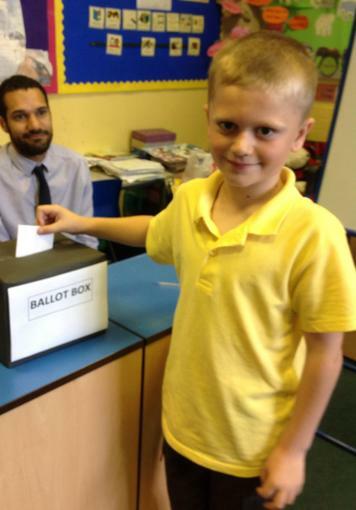 All Y3 residents (under the age of 9) have voted. 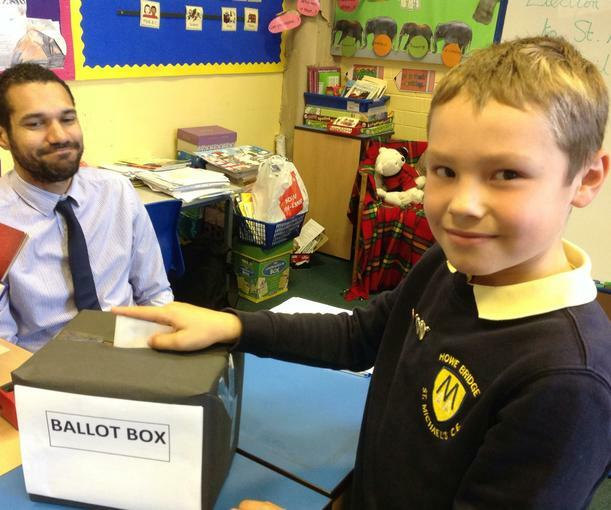 There was a tense moment for the Presiding Officer when a candidate requested a recount!